A man who injured a mother and son in a knife attack carried out during a "moment of madness" has been jailed. Scott Pearson was out celebrating his 32nd birthday when he set upon Lee and Joan Stafford outside the Golden Lion pub in Keswick. 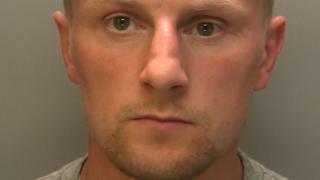 Mr Stafford needed 24 stitches in his calf and Mrs Stafford suffered a wound to her lip, Carlisle Crown Court heard. Pearson, 32, of Dene Court, Manchester, was jailed for 40 months after admitting wounding with intent. He also admitted unlawful wounding and having a bladed article in public. The violence had, the court heard, been a very "confusing incident", which was captured on CCTV and shown to the court. The Staffords and a man had gone to the Golden Lion after being involved in an earlier altercation at another location which saw Pearson being set upon. During the later fight outside the pub, Pearson was seen stabbing Mr Stafford in the leg. As Mrs Stafford tried to pull Pearson off her son, he was seen striking her in the face.